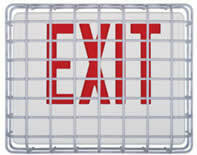 STI Exit Sign Damage Stopper 13.75"x10.5"x2.75"
Home > Facilities & Maintenance > Device Covers > Exit Sign Covers > STI Exit Sign Damage Stopper, 13.75"x10.5"x2.75"
STI Exit Sign Damage Stopper, 13.75"x10.5"x2.75"
Wherever exit signs are at risk from either intentional or accidental damage, installation of this super tough cover is the solution to the problem. This good-looking Stopper measures 13.75 inches (349 mm) long by 10.5 inches (267 mm) wide by 2.75 inches (70 mm) deep, large enough to cover a wide range of exit sign models available today. Installation is simple with anchors and screws provided. Q: does this product include mounting hardware ? A: Yes, this product comes with mounting screws and anchors.